Even though all three critical project factors should be respected equally, BD00 put “schedule” on top because the unspoken rule is “schedule is king” in many orgs. Ok, so you have heard them, but stop raining on my parade and let’s not digress. 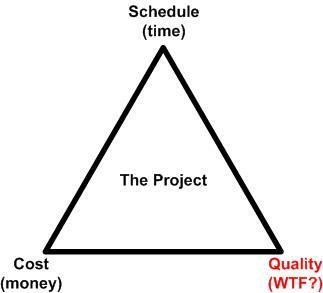 The reason that quality concerns are mentioned so infrequently relative to cost and schedule is that the latter two objective project attributes are easily tracked by measuring the universally accepted “money” and “time” metrics. There is no single, universally accepted objective quality metric. If you don’t believe BD00, then just ask Robert Pirsig. To raise quality up to the level of respectability that schedule and cost enjoy, BD00 proposes a new metric for measuring quality: the “WTF?“. To start using the metric, first convince all your people to not be afraid of repercussions and encourage them to blurt out “WTF?” every time they see some project aspect that violates their aesthetic sense of quality. Then, have them doggedly record the number and frequency of “WTF?”s they hear as the project progresses. Before you know it, you’ll have a nice little histogram to gauge the quality of your project portfolio. Then you’ll be able to…, uh, you’ll be able to… do something with the data? Where Are My Freakin’ Pants?!!! Any Obstacles?